Cinema Paradiso ends with what is probably its most famous and most tearjerking scene, and sets up that scene almost immediately, within its first 15 minutes of the film. But despite this clear (and brilliant) calculation, Giuseppe Tornatore’s film doesn’t come on like a maudlin melodrama. Much of it is upbeat, especially in the warmhearted and episodic first half chronicling young Salvatore (Salvatore Cascio), nicknamed Toto, and his obsession with the local movie house, the Cinema Paradiso, in postwar Italy. He shadows Alfredo (Philippe Noiret), the projectionist, as he screens films for a censorious priest, carefully protects the nitrate prints from catching on fire, and shows the movies to an adoring public. Though the relationship between Alfredo and Toto has some contentious moments, the boy eventually learns the projection trade, and the movie follows him into young adulthood. The frequent broadness of Cinema Paradiso, especially in the early going, makes it an excellent choice for a kid’s first subtitled movie. Some of the shenanigans involving various townsfolk are pitched at an almost cartoon level, exacerbated by the visual disconnect of Noiret’s clear dubbing. (The actor supposedly spoke in his native French, dubbed into Italian—though his performance remains expressive and touching nonetheless.) Indeed, the beginning and ending of the film could be easily edited into the kind of cutesy, hacky 20-minute short that would win an Oscar in a walk—and, not surprisingly, Cinema Paradiso did win the Best Foreign Language Oscar in 1990. But the movie’s delay between set-up and emotional release is key to its impact. The size of that delay varies; most cuts of the movie, including the version originally released in the U.S., run about two hours, but an earlier Italian release had 30 additional minutes, and a more widely available “director’s cut” runs a full hour longer. The two-hour version gives less screen time to the adult version of Salvatore, who (in the shorter cut, anyway) bookends the movie by looking back on his childhood. But that seems like the correct decision for a movie so rooted in childhood experiences, and so attuned to the way that a relatively short period of time can stretch out like the whole world. Much of Salvatore’s young life revolves around a single town square, and though the movie looks back with nostalgia, it also pushes against those feelings through Alfredo, who doesn’t exactly preach the virtues of a quiet hometown life. Its emotional moments, then, break the tension between rosy nostalgia and long-term reality—with tears, at least for some. 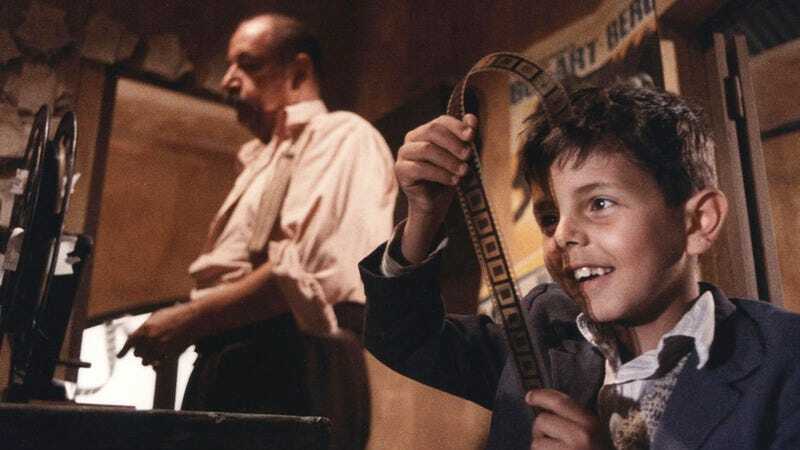 Cinema Paradiso’s sentimentality may be shameless, but it’s not dishonest. Availability: Cinema Paradiso is available on DVD and Blu-ray through Netflix or your local video store/library. It’s also currently streaming on Netflix.